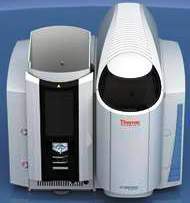 Thermo Scientific's iCE 3300 Atomic Absorption Spectrometer is a compact, easy to use, fully PC controlled flame atomic absorption spectrometer—upgradable with furnace and vapour generation options. It simplifies even the most complicated analyses. Its superior double beam optics provide outstanding performance, while the innovative hardware and software design ensures that running samples, developing methods and maintaining the instrument is easy.